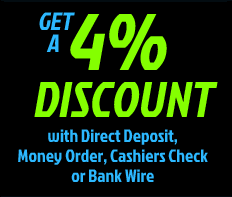 ***Motobuys offers easy instant credit financing options right here in our store! ***"oac" Get an answer in 60 seconds with Affirm Instant Credit Your order then ships fast right to your door! How does our instant credit offer work? Simple, buy now with the Affirm instant credit option at checkout and pay over time. We offer simple financing that fits your life. Call us (1-877-667-6289) now to start your layaway plan! Payment can only made by phone at 877-667-6289.